Looking back, it’s hard to remember how many people expected a coalition government to emerge from the 2010 election. Not that many, though the professionals probably knew better. Whether they predicted a Tory – Lib Dem arrangement that would last the full five-year parliamentary term is another matter. I had vague memories of a Labour-Liberal pact in the 1970s, when I was too young to vote, but no direct experience. So are we sadder and wiser, or do we like the new order? Looking at the opinion polls, it’s tempting to think the latter, but are people really voting for alliances? The paraphernalia of what feels like the longest election campaign in history remain aligned to pushing for an outright win: the manifestos, the giveaways, the presidential grooming of the party leaders. Perhaps only when parties campaign on the basis of pre-election agreements will we have moved forward. As to the specific policy legacy of the current coalition, the most surprising thing is the lack of constitutional change. After decades outside government, the Lib Dems were expected to demand big changes. Instead they staked everything on a PR future and were easily defeated in the referendum where the only beneficiaries of a Yes vote would have been the Lib Dems themselves. In a hissy fit after being beaten in the referendum, the Lib Dems blocked reform of constituency boundaries, handing a 30-seat bonus to Labour and a smaller one to the SNP. This may well determine the government in May 2015, and indeed exclude their party. Not very Liberal or Democratic. We have weakened armed forces, a reduced impact in foreign affairs, and an ever-increasing foreign aid budget. But all of these are Tory policies, not Lib Dem – the result of the political ring-fencing of NHS funding, and Cameron’s obsession with hitting the UN guideline of foreign aid to a total of 0.7% of GDP. We also have the Fixed Term Parliament Act 2011 (FTPA), of which more later. But nothing has changed in the House of Lords. As with the Scottish referendum, what appears to be the result the day after the vote may look different further down the road. Only four years after the country voted two to one against proportional representation, it now seems clear that the voting system will need to change. First past the post is a great system when there are only two parties picking up votes, and the third party sits between them. But the emergence of outsider parties (UKIP, the Greens) and regional forces (the SNP, albeit propped up by generously small constituencies in Scotland) means that it is no longer fit for purpose. The SNP stands to win more than 50 seats with 4% of the vote, while UKIP with 12% will be lucky to grab three seats. It is probably the case that Cameron would like to continue the existing coalition, rather than try to run a minority government. The delivery of a successful joint budget only fifty days before the election is proof that the leaderships of the two parties can work together. There is a section of the Tory leadership that would prefer a minority government, subject to the party achieving enough seats for them to tell the Lib Dems where to go. There would be more jobs for Tory ministers, and increased party unity. But every Tory must recognise that the chances of an outright majority for either party are miniscule, and those of reaching the “eff off” number are not much better. The Lib Dems would also probably like to carry on, since that is the best chance they have of remaining in government. But that all depends on the seat count. And at the moment the Lib Dems aren’t going to hang on to enough of their seats to be viable coalition partners. As things stand, the result is pretty clear: Con + Lib + UKIP = 299, Lab + SNP = 328. Labour should form a coalition (probably an informal one) with the SNP. This is despite a right wing projected vote of 47% (35% Tory, 12% UKIP) and a left wing vote of 42% (34% Labour, 4% Green, 4% SNP). The system is definitely broken. 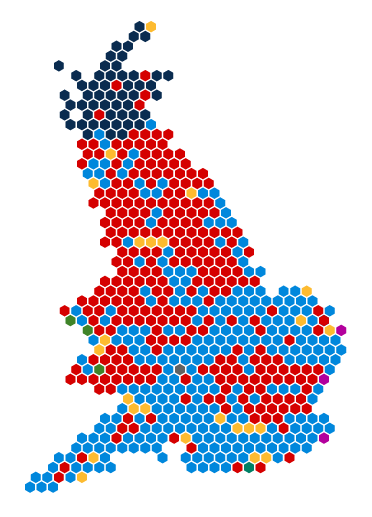 In fact, looking at the YouGov constituency map it’s tempting to go further and say that the country is broken. That looks like three countries to me, with the added complication that the the people who own and run London often don’t live inside its boundaries, and so are outnumbered by the people who work for them. There is then a 14 day period for attempts to form a new Government, which requires a motion of confidence to be passed in the Commons. This might be harder to pass than a no-confidence motion. On present numbers passing the no confidence motion in the present government would be easy, but would the SNP support the confidence motion in the new Labour government? They probably will as they have said they want to keep the Tories out. If they didn’t, there would be a second General Election, and Labour is probably too short of cash to win that one. It’s also possible that Cameron would resign and recommend that Miliband form a government. The Tories would then be unlikely to raise a no confidence motion and would probably abstain from one raised by UKIP. Even if they didn’t, the SNP wouldn’t support it and it would fail. The last minority governments in the UK were run by Labour leaders Wilson and Callahgan from 1974-79, but the apparent reluctance of Labour and the SNP to enter into a coalition means that they may be due for a revival. A true minority has to negotiate a majority bill by bill – assuming that it wants to make new policy. The alternative is a “confidence and supply” or “pay and rations” pact, where a smaller party agrees to keep a large but minority party in power under certain conditions, without itself joining the government. This was the system used by Callaghan with the Liberals in 1977-78. The Labour government included many senior and experienced politicians, and this solution worked well for a while. The advantage of a minority government is that it need not draft inexperienced MPs from the junior party into the Cabinet. This would obviously be helpful in the case of Labour and the SNP – there is the additional embarrassment factor of MPs committed to the destruction of the UK working inside its government. The coalition has performed better than was anticipated, and might reasonably be expected to be given another chance. However, the vagaries of the UK electoral system – confirmed in a referendum only four years ago, albeit against a completely different electoral backdrop – mean that it probably won’t. Instead, despite a swing to the right in terms of the popular vote, the split between UKIP and the Tories means that Labour are the most likely victors, partnering with their recent enemies in the Scottish referendum, the SNP. The embarrassment of having an anti-UK party in government mean that we might even see a return to the minority governments of the 1970s. Four years is a long time in politics. To see more of our election coverage, please go to our Election A to Z page. We continue our election converage with a roundup of the best quotes of the campaign.